Which of these beaches seems more your speed? The Gulf of Mexico runs along the west coast of Florida, stretching from the state’s Panhandle down to Key West. The most populous cities are found on the Central Gulf Coast (Tampa and St. Petersburg) and in the Southwest Florida region (Sarasota, Naples, and Venice). Some of Florida’s prettiest beaches are along the Gulf of Mexico, and these five are not to be missed. Clearwater Beach and its pier come alive during sunset. Clearwater Beach is always topping Best Beach lists, and as soon as your soles sink into the soft, warm sand, you’ll understand why. It has everything a beach needs–lots of crystal clear water, silky shores that are perfect for walking or sandcastle building, and a pier that attracts throngs of residents and visitors every night (except Christmas) for the Sunsets at Pier 60 festival. From two hours before sunset until two hours after sunset, the 1,080-foot fishing pier comes alive with food, entertainment, and dozens of stalls where local artists and craftspeople sell their treasures. 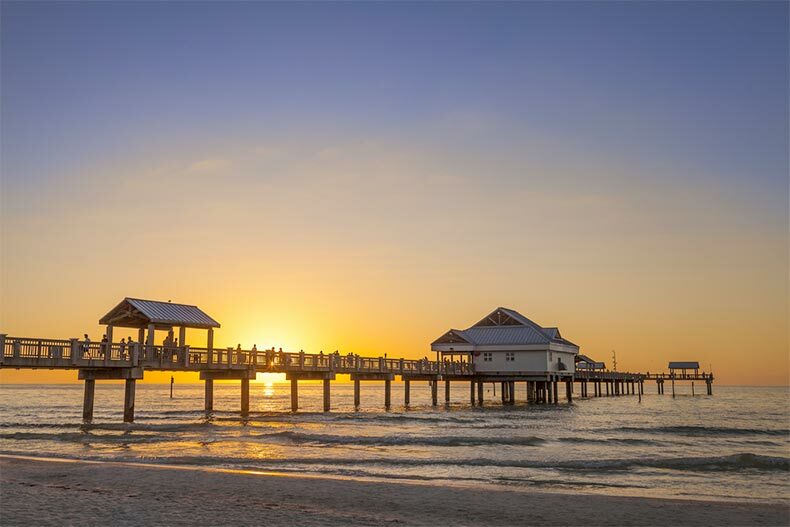 This nightly event, along with picture-perfect sunsets and Gulf of Mexico views, makes Clearwater Beach easily one of the best beaches on the Gulf Coast. Siesta Key is known for its soft, white sand. 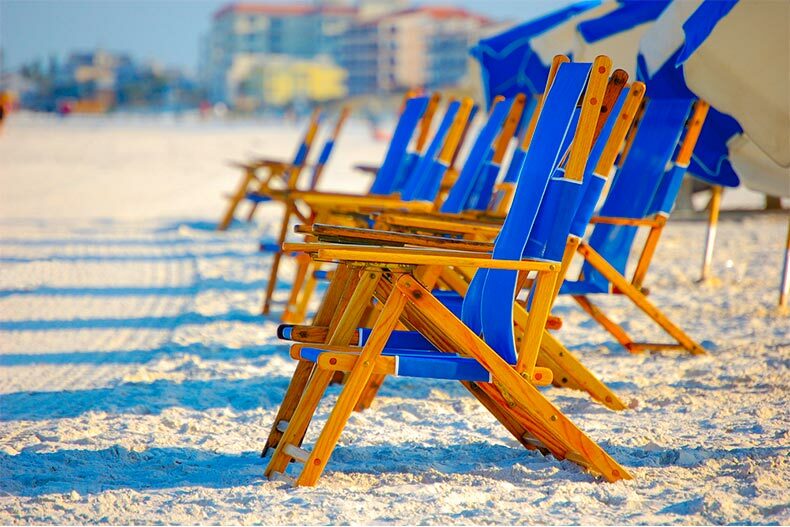 One of the Gulf beaches best-loved by locals is Siesta Key. Known for its soft, white sands and its free parking, this beach is perfect for families and gatherings. There are lifeguards stationed every few feet and full concessions that feature beach-friendly hot dogs and ice cream. Siesta Key is an island not far from Sarasota and about an hour’s drive from Tampa via Interstate 75 south. If you hate hot sand, this is the perfect beach for you. Kick off your flip-flops and enjoy the 99 percent quartz-crystal sand, which stays cool no matter how hot the Florida sun gets. Just off the beach is Siesta Key Village, where there are plenty of restaurants, bars, shops, and cafes to enjoy when you’re done with your beach day. Buy some souvenirs or stock up on suntan lotion and aloe. You can also eat some fresh seafood or enjoy a cocktail with an umbrella in it. 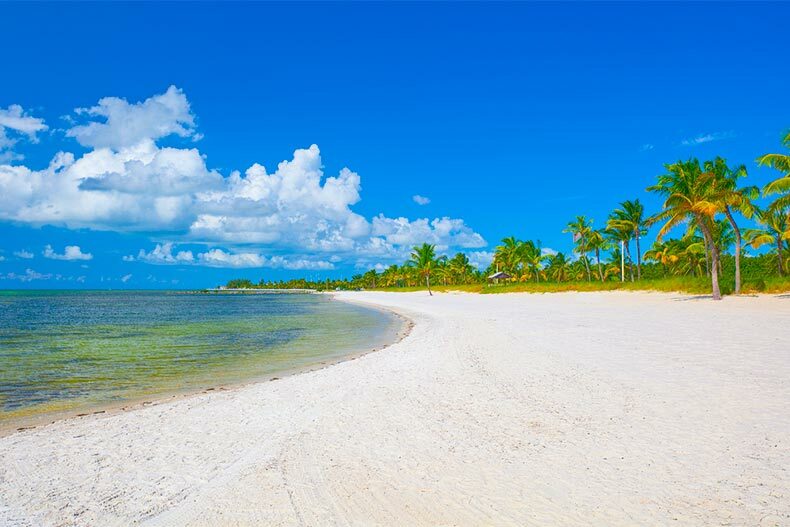 When crowded beaches aren’t your thing, head to Bunche Beach Preserve on San Carlos Bay, just outside of Fort Myers. The beach is completely natural and without landscaping, leaving you with the sense that you’ve discovered a part of the Gulf Coast that no one else has seen. The waves are gentle and the water is warm. The views are tremendous, and you can create a quiet scene with a good book, a picnic lunch, and a set of binoculars to check out the birds and wildlife on the shore and in the mangroves. The tidal wetlands on this beach are a living ecosystem that has been left untouched to remind visitors of what “Old Florida” looked like. It’s a treat for naturalists and anyone who doesn’t need a party to have a good beach day. 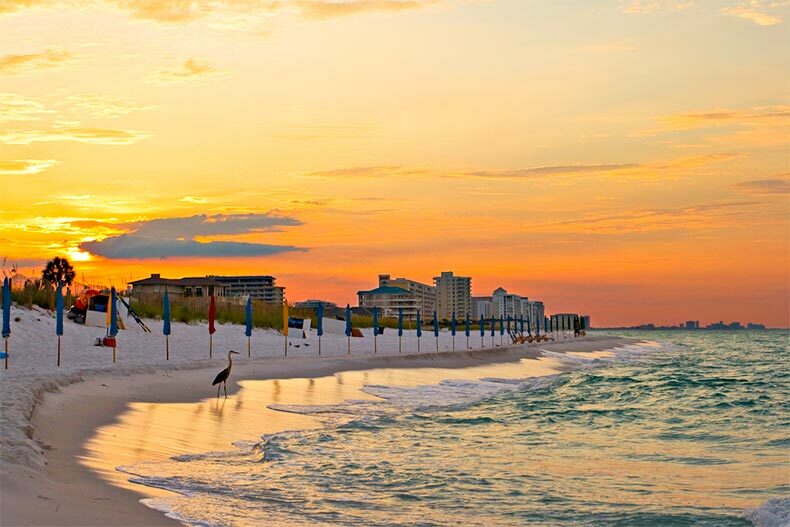 Sunsets are a popular thing on Gulf Coast beaches, especially in Destin. With Panama City still recovering from the mess Hurricane Michael left behind in September of 2018, Destin makes an excellent beach retreat for active adults in the northwest part of Florida. This coastal community calls itself The World’s Luckiest Fishing Village, an indication that you’ll eat great seafood while you do your beaching. The most popular place for beach fun in Destin is Henderson Beach State Park, where you’ll wade in warm Gulf waters in front of white sand dunes. The beach meets the forest in Destin; there are oak trees and pines lining the dunes and leading to nature trails that wind away from the beach. Visit the boardwalk in the harbor for shops, food, and drinks. This beach is a closely held secret, but we’re willing to share it with you. While Bradenton and Sarasota are full of beautiful, well-visited beaches such as Anna Maria Island, Coquina Beach, Longboat Key, and others, the best place to enjoy the water and the waves is Whitney Beach. It’s not easy to find; you’ll have to clear yourself of the high-rise condos that line the coast in this area of Bradenton Beach. Park near Broadway, just off Gulf of Mexico Drive, and stroll along the wooden walkway to the sand. It’s soothing and pretty, and the best times to go are early in the morning and towards the end of the day. There’s a cost to the tranquility of course – there are no amenities.